The beautiful Duna wood chair is a uniquely designed chair that combined with, its low price, is the perfect choice for upscale restaurants, cafes, bars, hotels and other luxurious venues. For the desired look, you can choose between a 1" thick solid saddle seat or a seat upholstered with vinyl or fabric. 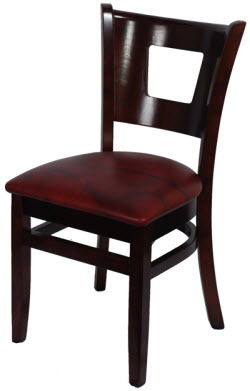 For more information about our wood restaurant chairs please call (888) 998-4222. 17.25" W x 32" H x 20.75" D; Seat Height: 18"